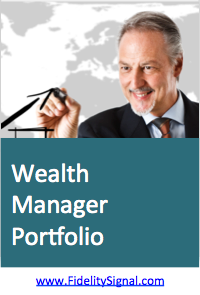 In the previous parts of the series we highlighted a handful of excellent Fidelity mutual funds that allow investors to build up core positions representing small cap stocks (see article), value investments (see article) and corporate bonds (see article), assuming that the current economic and market trends continue in 2014. We also highlighted gold, as a potential contrarian investment (see article). While gold did not hold its recent support level and continues its downtrend, we expect that the gold mining sector will bottom in the first half of 2014 and may become an attractive investment again. Today, let’s take a look at international investments, which can be used to diversify U.S. equity holdings in your portfolio. International equity markets have underperformed U.S. equities in 2013, but this may change in 2014. Currently Europe is the strongest with Nordic economies leading the way, but even a the weaker economies, such as Spain, Italy, Greece and Poland are expected to do well next year. The weakest international investments in 2013 have been mutual funds investing in Latin America. The boom-bust market cycles are not unusual in that part of the world going back to the 1980, when these markets first became accessible to foreign investors. We regard funds focusing on Latin America as contrarian investment opportunities for 2014 with great potential to produce gains once the world economy starts growing again. Thirdly, Asian investments have produced mixed results in 2014. Japanese equities were very strong in the first part of the year due to their weak yen policy, but rolled over and now in a broad trading range. Many investors and commentators cheered the recently introduced economic reforms in China. We are keeping a close eye on investing opportunities not only in China, but also in India and fast growing South Korea. Unique opportunities may also present themselves in the so-called “frontier” markets, such as Vietnam. Fidelity has many excellent international mutual funds, but the one that stands out, as a great tool to diversify core holdings is the Fidelity Diversified International Fund (FDIVX). The chart below shows that its management team has been highly successful in identifying the right investments and generate an outstanding 22% return for shareholders so far in 2013. We all hope that 2014 will be as strong, as 2013 has been. In reality, financial markets seldom advance without any interruption. Our previous study showed that U.S. equities are overbought by historic standards and now ripe for a correction (see article). That is why we suggest our readers to review the model portfolios at FidelitySignal.com, which provide buy and sell signals, and E-mail alerts for specific Fidelity mutual funds. High-flying stock market sectors have received a lot of news media attention this year, since the top sectors have produced outsized returns. 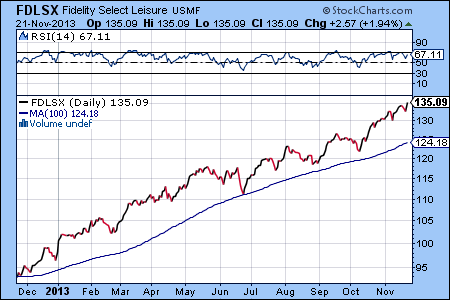 For example, the Fidelity Select Biotechnology Fund (FBIOX) has gained 62.54% so far in 2013. Will this performance continue in 2014? History of the stock market tells us that it is unlikely. In fact, we have to go back to 1999 to see similar returns. And we all know what happened in the aftermath of the speculative stock market bubble in 2000. Looking ahead to 2014 most economist draw a picture of continued economic growth in the U.S. The problem is that this can lead to an early decision by the Fed to taper the QE3 program, which will likely to have a cooling effect on equity markets. As we consider the best investments for 2014, it is worth taking a closer look at value investing again. Value investing is a risk-averse approach for investors who would like to participate in the equity markets, but are worried about the potential of a large stock market correction in 2014. 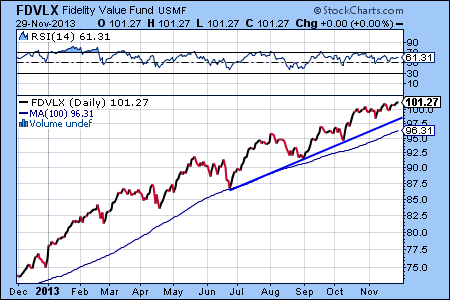 Our favorite investment in this space is the Fidelity Value Fund (FDVLX). FDVLX has returned 36.85% since November 30, 2012, when FidelitySignal.com issued the buy signal. 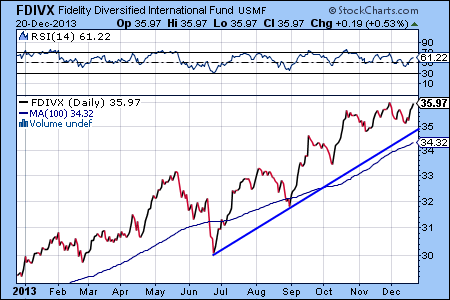 The chart below shows that FDVLX has been a solid investment in 2013 and the bullish trend continues to stay uninterrupted. The worst performing Fidelity mutual fund currently is the Fidelity Select Gold Fund (FSAGX) according to the fund ranking provided by FidelitySignal.com. Often, laggards become next year’s winners, and this is just one of the reasons for investors to pay attention to gold. FSAGX is also forming a triple bottom chart pattern. If the support holds (see blue line on the chart), then it will be a very bullish chart formation for gold stocks. In addition, recent 13F filings indicate that hedge funds are buying gold bullion and gold mining stocks again. 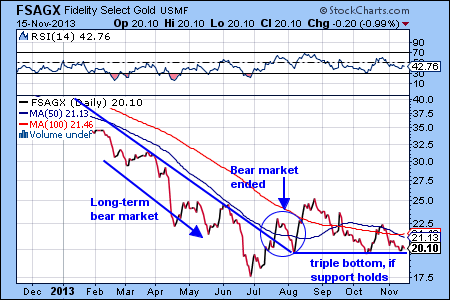 We identified the end of the bear market for gold stocks in the blog post on August 16. The bullish trend continues for the gold mining sector and the Fidelity Select Gold Fund (FSAGX, last change: 1.65%) is one of the best mutual funds available for investors to participate. While the general stock market is weakening and we are heading into the often volatile fall season, FSAGX may be a good choice for investors seeking capital appreciation. 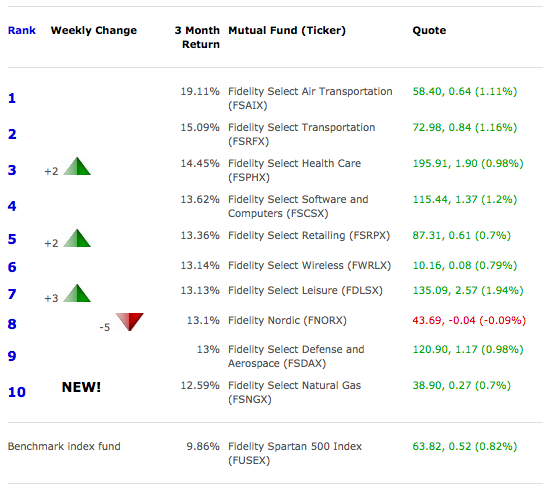 The Fidelity Select Health Care Fund (FSPHX, last change: 1.12%) is one of the strongest performing Fidelity funds in August. FSHPX is now ranked amongst the top 10 Fidelity funds by FidelitySignal.com. The Fidelity Real Estate Investment Fund (FRESX, last change: -1.94%) is the weakest performer in our survey of Fidelity mutual funds. FRESX lost 14.1% in the last three months. While a snap-back rally can occur at this oversold level, investors are best served by continuing to avoid this sector.